The companies' chairman weighs in how they unlock value. 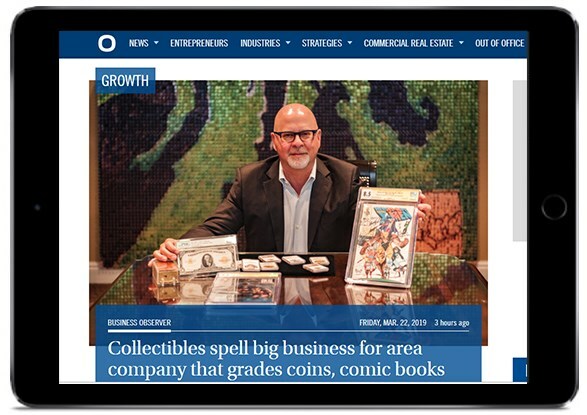 The Certified Collectibles Group (CCG) companies were featured in a recent article by the Business Observer, a leading news source in Southwest Florida, where CCG is based. In the article, CCG Chairman Mark Salzberg provides insight into how the collecting world is well-served by the various CCG affiliates, including Numismatic Guaranty Corporation (NGC), Numismatic Conservation Services (NCS), Paper Money Guaranty (PMG), Certified Guaranty Company (CGC), Classic Collectible Services (CCS), Authenticated Stamp Guaranty (ASG) and Collectibles Authentication Guaranty (CAG).